This eight lesson e-course is an introduction to the seven days of the week: a magical, Goddess-centered approach to discovering pathways to new inspiration and motivation each day. Work, family and other obligations can sometimes interfere with the natural rhythms and ancient patterns of living that our ancestors recognized, organized, and handed down through the generations.When you lose touch with the spiritual aspects of the seven day week, enthusiasm dissolves into boredom, mundane tasking and repetitive habits. Rediscover the meaning and unique qualities of each day, and enjoyment of the present moment becomes a possibility. Time-keeping is revitalized as a creativity energy that can even help open the door to visionary goal-setting for a brighter future. Each lesson will highlight one of the seven days of the week, with emphasis on daily correspondences and how to use them for inspiration. We will also delve into the legacies we have inherited from mythological Goddesses and Gods and how these archetypes influence us, and practical suggestions for how to make each day of the week vital, unique and part of a larger cycle of continuous renewal. This 8 lesson online course will allow you to work at your own pace, go back and review the lessons any time, and post comments for discussion with other students taking the e-course. Due to the informational nature of this course, there will be no refunds. Due to the present economy, a sliding scale will be offered to make this course available affordable for everyone. Please accept apologies for any inconvenience. Everybody knows that Monday is the beginning of the school or work week, Wednesday is hump day, and Friday is TGIF, or thank the Goddess it’s Friday! In antiquity, however, the seven day week did not exist. Instead, the natural energies of the sun, moon, and the planets, helped people tell time. Heavenly bodies were honored as divine, and represented both male and female genders, depending on the culture. A strong feminine aspect of lunar energies within hearth, home, and an association between the moon, the Goddess energies of the mother, and a safe return home from primitive work were observed in many ancient cultures. Counterbalanced with a masculine solar deity, representing energy, work, and daylight activities, a lunar Goddess explained in elementary human terms, an archetypal relationship symbolized by a repeating pattern of feminine and masculine energies every 24 hours. This pattern of masculine and feminine differed, depending on the beliefs of the people within a culture or region. Some mythologies embraced a masculine moon, a feminine sun, and other combinations. The twelve month calendar is a relatively new invention. 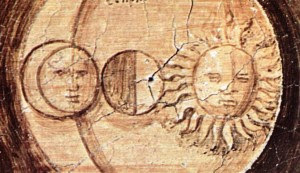 Ancient people noticed that there were two full moons every 59 days, and the first calendars in many cultures measured days and nights in a repeating cycle of three types of moon phases; new, full, and in between. Echoing the three types of moon phases, a “triple Goddess archetype” appeared in many forms and mythologies throughout the world. This trio of powerful female forces represents the sacred, divine feminine moon energy watching protectively over all who depended on Her for guidance and nurture. 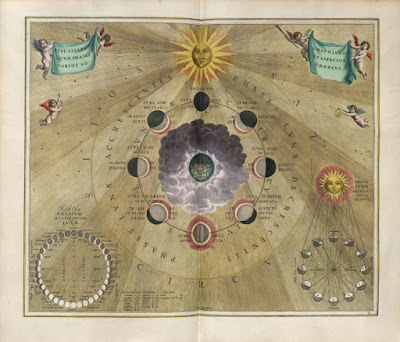 The lunar months, measured in repeating cycles of moon phases, were often designed to end on the dark, black or new moon, with a crescent moon symbolizing the birth or rebirth of the new month, for a grand total of approximately thirteen annual lunation cycles in a year. Four distinct moon phases are clearly visible each cycle: the dark or new moon, the waxing moon (becoming lighter), the full moon, and the waning moon (becoming darker). Each lunation, with four different cycles, boils down to slightly more than seven days for each moon phase. The seven-day week continues to organize human lives in a repeating pattern of seven alternations of dark and light, night and day, lunar and solar. Because the moon represents divine feminine energies, and the week is based on moon phases, accessing lunar Goddess energy can be done at any time, on any day or evening of the week. In addition, there are more divine, Goddess and planetary energies that can be accessed on specific days of the week, and also astrologically, which is beyond the scope of this course. What are Correspondences and Why are they Important? A correspondence can be any of a number of conceptual, physical or sensory tools that are used in spiritual practice to represent, empower or remind ourselves of a concept, goal or desire. Correspondences can be decorative or basic, obvious or hidden. Correspondences can provide an effective focal point for ideas, goals and concepts, and also help dramatize and empower a private, personal or group act of spiritual prayer. Correspondences can be grouped together for greater emphasis, or offered separately for the purposes of ease, simplicity or due to space constraints. This is a simple altar piece I created as a bouquet of garden flowers. 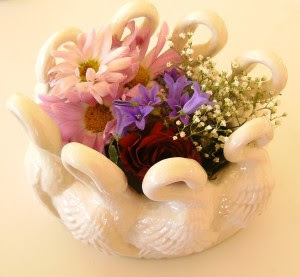 The swans on the vase represent the Roman Goddess Juno, one of many moon Goddesses. Many correspondences come from nature, or can be realized in ordinary household objects that are already imprinted with your personal energies, and then cleansed and/or repurposed with focus and intention. Although it’s not necessary to buy anything to work with correspondences, there are numerous products available to purchase, like candles, crystals, and incense. Some may be simple and inexpensive while others are extravagant and costly. If you choose something new, it is wise to choose carefully and watch your budget, because overspending on unnecessary items is very easy to do! Correspondences can include plants, planets, numbers, names, colors, scents, herbs, flowers, foods, and much more. Each day of the week has a different set of correspondences, and although there is some agreement on what they are, there are also different opinions. Go with what feels right for you, and don’t worry about getting everything perfect, or using every correspondence. Try to work with at least one correspondence that resonates with you each day of the week, and allow the mystery, magic and vibrations for each day to come to you naturally. 19th century stone and gold bracelet with cameos of the Olympic gods. 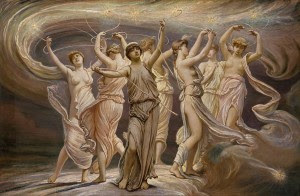 From left to right: Diana the moon Goddess for Monday, the masculine Mars for Tuesday, Mercury for Wednesday, and Jupiter for Thursday, Goddess Venus for Friday, deities Saturn for Saturday, and Apollo for Sunday. If you like, you might want to set up an altar for the seven days of the week. You might create an altar with a nice tablecloth, candles, flowers, or crystals that represent correspondences you choose. It can be a pretty seven-day altar at home, set up on a day of the week when you’re not usually busy, to last throughout the entire week. Or, the altar could represent a simple goal for the business week, with a subtle correspondence changes for each day. If there is an important date coming up, you may wish to notice what day of the week it will be, and create an altar with correspondences for that specific day, to empower your decision-making and help keep a positive outlook. Altars can be temporary or permanent, on a dedicated space, like a shelf or the top of a piece of furniture, or part of a regular workspace. An altar can be a well organized spice rack in the kitchen, a closet arranged by colors, a bouquet of flowers or an awareness of the scents of perfumes you frequently wear. Keep it simple, when you start. Tending an altar should be a pleasure, a reminder of the divine, and not a chore. Another way to use correspondences is to treat your sacred self as a living Goddess Temple. Have you ever stared into the closet, late for work, without a clue what to wear? Thought about what to cook for dinner and come up with a blank? Gotten so busy that you forgot what day it is? Learning and using daily correspondences can help make easy work of choosing colors, styles, jewelry, meals, spices, fragrances and much more! Daily correspondences will be covered in each lesson. Of iron kisses, kisses linked like steel. Upon you, wrapped in indomitable me. What images come to mind when you think about the days of the week? How do lunar and solar energies enhance your perceptions? How is the idea of correspondences for the days of the week insightful or inspiring to you? Have you created an altar? Post a picture if you like! Copyright 2017 E. Sylvia Simpson. Picture Window theme. Powered by Blogger. This site includes affiliate partner advertising text links and banner links. We may receive money after you click through ad links. Advertisers may place a cookie when an advertising link is clicked. This site does not endorse advertised products and services, unless noted otherwise.